I like chocolate dark, three taste buds shy of bitter. One small bite and I start getting messages from my brain saying, “Thank you,” and “More, please.” As food, it delights my tongue, and as medicine, it soothes my brain. I have liked chocolate since I was a small child and discovered that the Easter bunny laid small chocolate eggs in my Easter basket. I later learned that rabbits do not lay eggs; they do, however, extrude something that is eerily similar to little chocolate pellets. I lived with that disturbing juxtaposition of ideas for years, but eventually got over it and continued trying to consume my allotted 11.64 pounds of chocolate each year. That’s how much each American averages. The Swiss eat almost twice that. Clearly, I was born in the wrong country. As an adult I have lived a relatively undisturbed life as far as chocolate goes. However, these last few years, an uncomfortable truth has been knocking on the door of my brain. It has pamphlets, which is always a bad sign. Opening the door means I must listen to a prepared speech, sign a petition, and probably donate some money. Maybe even the money I would use to buy chocolate. For me, the best chocolate has at least 70% cocoa. That’s the ingredient that has so many health benefits, including helping to protect my heart. 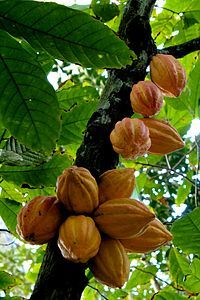 Cocoa makes my brain happy; and like so many gifts, it grows on trees. The cocoa plant is delicate, especially when it is young. It requires attention, care, and nurture to develop properly. If a plant is tended carefully, it can start bearing fruit when it is four or five years old and produce for several decades. Cocoa plants sound a lot like children, don’t they? Children need care and nurture to grow properly, too. And that’s the problem. 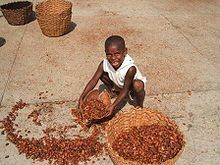 Many cocoa farms employ children, and some farmers enslave children, making them work 12 hours a day without pay or much to eat. At night, the children are locked up. If they try to run away, they are beaten. I don’t want to eat chocolate that has someone’s childhood as its main ingredient. No amount of sweetener can make that kind of bitterness palatable. And if I know that the price on my candy bar is low because some children are forced to pay the real price by spending their childhood enslaved on farms, no amount of inexpensive chocolate is going to make me happy. My tongue doesn’t mind at all; it likes chocolate no matter what, unlike my brain, which has nothing better to do than gossip with my heart. Once my heart gets involved, the two of them always insist that I do something. Refusing to buy chocolate might make me feel good, but that’s about all it will do. It won’t help the thousands of smallholder farmers in West Africa, Indonesia, Brazil, and Ecuador who grow cocoa. They deserve a living wage; however, they receive only a pittance of what I pay for chocolate. Some of these farmers resort to forced labor to make growing cocoa worth their while. If I’m going to enjoy eating chocolate, I can’t ignore these facts. Ignorance is bliss until it isn’t. Now I have to pay attention, read labels, and check up on the companies I buy from. I have to sign petitions. And I have to pay more money for chocolate that doesn’t have “essence of childhood” as an ingredient. But I don’t mind because then I can start listening again when my brain says, “More, please.” And it will make my heart happy again in more ways than one. To see the places I have been that knocked the bliss out of my ignorance, go here, here, here, and here. To see the places my heart and brain conspired to send me, go here, here, or here to see what people are doing about it. Have you tried the coconut M&M’s? Tres yummy! I haven’t even heard of them. Apparently, I am out of the M&M loop. I will take some time today to visit the sites you’ve linked so that I may once again feel good about my favorite indulgence. I realized that this might be a downer for some people. That was not my intention. I’ve been researching the history of chocolate and have been repeatedly bumping into this issue. I think our choices matter. I so agree. Your post drove me to the web in search of “safe” chocolate. Happily, I found not only several choices of chocolate that are readily available to me but also lots of other ethical product choices as well. Thank you! And Happy Easter! To my mind, it’s a perfectly balanced piece …. humorously commenting on your addiction …. and mine. ( I eat more than one pound of chocolate week …. so that puts me way ahead of the Swiss into a category of my very own). But also pointing out some unpleasant truths about the production of cocoa. Providing the links so discreetly at the bottom was the perfect touch. I signed ….. I can’t hit the like button. This is so distressing that I may have to consume large quantities of chocolate to get over it. It’s like blood diamonds — blood chocolate. Sigh! It is distressing. There is a lot of child slavery in the world – not just on cocoa farms. It doesn’t seem like we can do a lot about it, but just doing a little is good, too. At least that’s my belief. I’ve looked at your awareness sites, not perfectly, but skimming them. Could you please let me know if there are any chocolate companies I can patronize that are innocent of this abuse? I can’t do without chocolate, but the slavery aspect is sickening. Thank you. I’m no expert, and I have just been exploring this issue for a short while. Below are a few of the sites I found helpful. I didn’t click the here, here, and hear buttons. I believed you at once… even though I had never seen a single pamphlet. As the years have gone by, I have grown more and more aware of the fact that I’m part of the privileged few… and that a lot of people… most, I would say, live much harder lives than my own. In certain respects, it has made me live more modestly. But I knew all the while, that there is very little that I can do to change the world. When I was young, I thought it was possible. I was willing then, to make great sacrifices. But to my sorrow, I realized, that most of my efforts were in vain. However, I still have the hope, that we can make a small difference… in the way we live, and by sharing our awareness, and by proper relations with our fellow man. People with a lot of money, or great genius… people like Bill Gates… they can make even more of a difference. But I try in my modest way, to make a little difference myself. I know you make a difference, yearstricken. Because almost every time I read one of your posts, I feel strengthened. We do live privileged lives, and that means we have a certain level of responsibility. I believe in small differences, too, and I believe we are here to do good. I hope that the post doesn’t come across as if I am telling others what and how to choose. We are all on a different point on our journey. Many are far, far ahead of me. But I think it’s good to share with one another some of the things we have seen and learned. I am heartened to hear that you feel strengthened and not judged. My dear yearstricken, what I get from you is always positive. If ever you choose to judge me, I will listen with great respect. I’m enamored of the Equal Exchange brand. I trust it because my food cooperative has endorsed it. Hmmm….should I do my own investigation before eating my wonderful square of dark, dark chocolate? Thanks for bringing a dark issue to light with such wonderful words. As usual. Ultimately we all have to trust someone, don’t we? Even if I do research, there comes a point where I have to trust what is written or said because I can’t travel to the cocoa farm and check for myself. I have been to the Equal Exchange website (see the link in the comment above) and they look like a good source. I admire your food cooperative for taking time to look into where the cocoa comes from. I am so proud of you, my friend! A strong and principled post. I’m all for pleasure, but not at the expense of someone else’s pain…and finding out whose isn’t easy in this “global market” world. Yay for you. It’s a fight worth fighting. Thank you, RAB. I really appreciate your words of support. What a timely and important piece. Thank you. I have a friend who works for the World Bank inspecting cocoa plantations in West Africa. What has she found? That when the business is owned/operated by women, that there is significantly less abuse and a better market for “fair trade” cocoa. It matters that we pay attention. I boycotted Nestle for nearly 20 years after they promoted use of infant formula to 3rd world women, whose own milk dried and who couldn’t afford the formula. When we lived in Switzerland (97-02) EVERYTHING is made by Nestle, I had to stop boycotting them or starve. Guess it’s time to start again. Thanks for sharing that, Elyse. It does matter that we pay attention. Maybe we need more female cocoa farmers. Switzerland consumes a lot of chocolate. I had no idea it was mostly Nestle. No, not the chocolate so much — it’s other things. Nestle’s makes EVERYTHING — cereal, canned goods, breads. It is astonishing just how much they make. It is not as bad here, but you would be surprised to see how often their name comes up on labels in the fine print. I am very grateful to this post — I had no idea! I’ll be researching some fair trade chocolate sources — we see “fair trade” labels on coffee — hopefully packaging on chocolate will soon alert us all to the sad cocoa bean situation. I really do appreciate that you wrote this — sometimes we just have to raise our hands and say “excuse me, did you know about this?”. I’m glad you liked it, Natalie. I think we do enjoy products more if we know the workers or farmers receive a fair wage. Although I can’t eat chocolate, I think it’s the most delicious food on the planet. Sadly, I haven’t had any for about 20 years. But I do buy it regularly for my family and will most certainly check out your sites for fair trade options. This was an excellent post – new information to me – and I appreciate your honesty…despite your obvious love for this devilishly delicious delight. I do love me some chocolate. I’m sorry that you can no longer eat it, but there are so many good, wholesome things to eat in this world. I’m so glad we have the Internet so we can search things out like fair trade. Excellent post. I had a dream the other night that I died (this is a different dream than the child soldier dream – I thought we weren’t supposed to be able to die in dreams??) and was plopped down in this place where I was shown the “Small Deaths Wall.” It was a brick wall with a series of flashing 3D maps showing how my actions and inactions had affected the lives of people across the planet in a negative way . . . . Apparently, my brain and heart are conversing quite a bit while I’m asleep. Please write a post or a story on your blog about this. You have some truly great dreams. Actions and inactions – both have power. Attention matters. Chocolate is a joy. 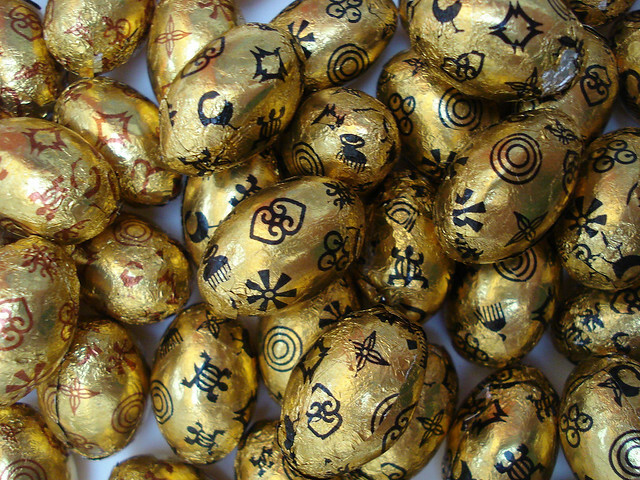 So we have to pay a little extra attention in choosing our chocolate? Then absolutely, so we must. Humane production of any commodity should not only make the commodity itself more palatable but should make life so for us all too. I agree wholeheartedly. Knowing the workers receive their just wage only increases our enjoyment of the product. Thank you for reblogging it. Now, I too, must do something about it. Thanks so much for jolting me awake. I think if we all make choices, we can make a difference. Okay. I vote with my wallet all of the time. Quietly and privately. I did check your links, and I do believe in proper Fair Trade policies, and I have a small connection to West Africa through a long-time friend. I have two vices— sweets (dark chocolate, specifically) and coffee. I’m in. No more human-traffic chocolate. I will be reading and signing the petitions you mentioned. I hope it is okay to post this here. It is from the University of California San Diego. As it is from 2009, I think I will double-check to make sure that these folks are still doing right by people three years after this study. This is my third major ” wallet-closed” boycott this year. Each one has been quite personal. This one may be the most personal yet. Given the circumstances, it can’t be personal enough, as far as I’m concerned. Voting with our wallets matters. I’m glad you shared the link; I also put it in an answer to someone’s comment up above. Small acts are like small hinges; big doors swing on them. Chocolate is something I don’t think I can do without. Even if I’m diabetic! I can have chocolate but only in very small doses. While they say comfort eating is not a good thing, I think a small piece of chocolate once in a while is good for the soul. Real chocolate, none of those diabetic chocolate things! I agree that chocolate is a lot like medicine. A little dose now and then is good of you. I agree with techlady911 and loved the entire post, but especially this line: “I don’t want to eat chocolate that has someone’s childhood as its main ingredient.” I find it encouraging that we’re finally thinking about where our luxuries come from, and if others are suffering a lot just so we can have a little pleasure. Thank you for writing this.